The bottom edge of this afghan is curling up. It is not stockinette, so I was surprised when it started curling. It is acrylic yarn, so blocking won't help much. The only thing that I can think of to do is "kill" the yarn - just on the curling edge. I wanted to check with you all before doing that drastic measure. Thank you! If you can crochet, a row or two single crochet, 3 stitches in each point, will help, if a trip through the washer and dryer don’t, when it’s finished, of course. You can use steam from an iron held several inches above the wrong side to block without killing the acrylic. I think crocheting the edge would ruin the nice stitch pattern. I would machine wash it and lay it flat to dry on towels on the floor.. I've been chairman of the afghan projects for our knitting guild and have had a lot of experience with blocking acrylics and acrylic blends and they always flatten out well using this technique. Your cast on was too tight. Do the single crochet on both ends to match. 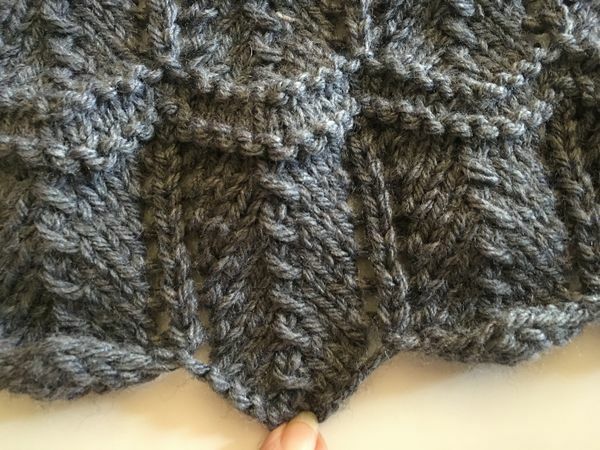 I usually knit a segment of garter before starting this pattern. I’m with Fergablue, steam it, pat it flat and you should not have to do it again. I agree--the cast on is too tight. That's why I like having so many different kinds of cast on available. I also agree and a crochet edging isn't going to help either. That too tight edge is simply going to pull the crochet edging with it. Casing on with a needle 2 sizes up will prevent this. What is the pattern, I like that a lot. Have to agree that the vast on looks like it could do with being 're knit a couple of needle sizes up, but lovely work. I wonder if the technique in this video might help. If the cast on is too tight I have doubts. Sorry. I'd only kill the acrylic as a very last resort. If you used a long tail CO to start your project; the cast on technique in this video may help the next time you start a lacy pattern. I think this is what I'm going to do. I don't think the cast on is too tight to do it. Thank you for the link! I'm going to do it from the back so it won't show as much and will help the cupping. Thank you so much for this link! What a great, easy cast on. I'm going to do this first to flatten it somewhat. Then I'll do the crochet trick mentioned below if it's still cupping. Thank you! 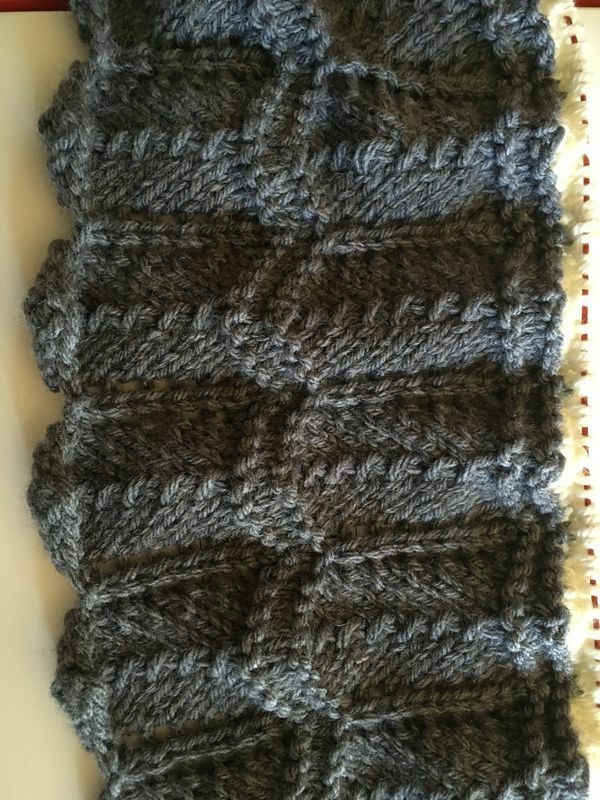 It is an afghan kit from Mary Maxim called Sandstone Ripple Afghan.